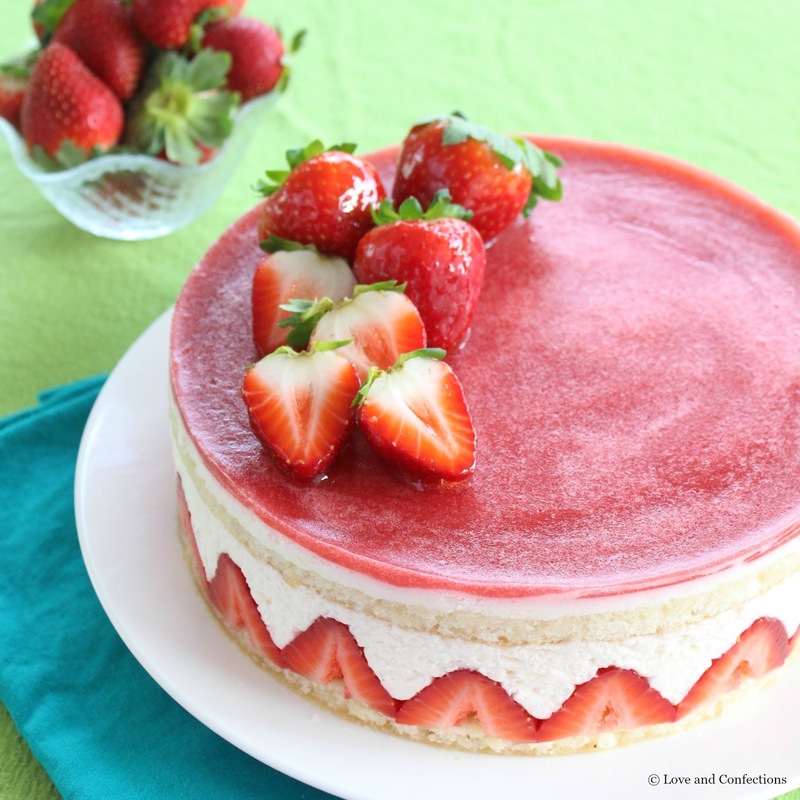 Strawberry Faisier is the perfect dessert to showcase beautiful Florida Strawberries. Delicate syrup-soaked sponge cake is filled with strawberries and vanilla cream. It is a feast for the eyes and the tastebuds! Strawberry season is here and I am ecstatic! 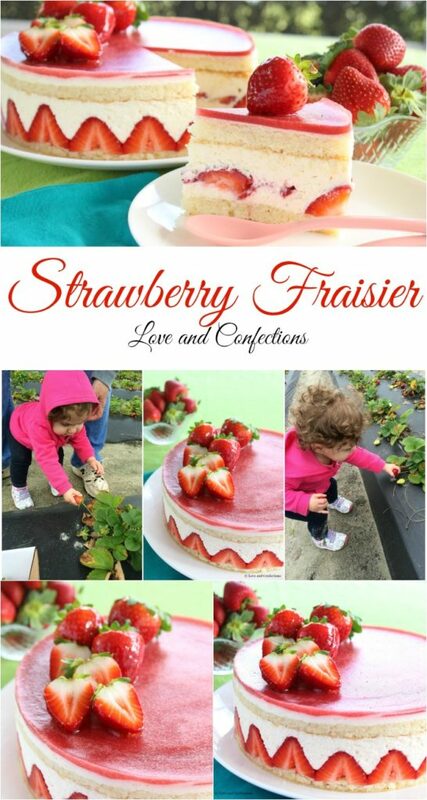 Last year was the first time I went strawberry picking with #ToddlerLnC – she was about 15 months old at the time. Our whole family enjoyed picking strawberries out in the field and the Toddler enjoyed eating them as we picked. I think her train of thought was “one for the basket, one for me”. Strawberries have always been one of her favorite fruits. 8 medium strawberries equal your daily requirement of vitamin C and we love supporting locally grown, nutritious, and delicious Florida Strawberries. Fresh from Florida Strawberries are available December through April, so everyone experiencing Winter can enjoy the fresh Summer taste all season long. We can’t wait to go back to the fields for a family outing and pick strawberries again. There are so many delicious recipes I enjoy making – sweet, savory, and cocktails. I decided that my first recipe for Florida Strawberry season had to be a show-stopping cake – the Fraisier. In culinary school, one of my classes was Contemporary Cakes. There were actually a couple chefs that taught this class and I, unfortunately, was not placed with the one I wanted. While I did create a lot of cakes that I enjoyed, I missed out on some really good instruction and great contemporary cakes from the other chef. The Fraisier was one of the cakes the other chef had the class create, so I was able to go in after, and get a mini lesson and take pictures. Fast forward a few years to my time at a small French Bakery. Low and behold, once strawberry season hit, I had to create Fraisiers – lots and lots of Fraisiers. After being instructed on how to make them, and lots of practice, I succeeded in creating some delicious cakes. These gorgeous Fraisiers seem in depth and difficult to make, but are really straight-forward, simple steps. Faisier comes from the French word “fraise”, meaning “strawberry”. It is a delicate sponge cake that is soaked with an alcoholic infused simple syrup. 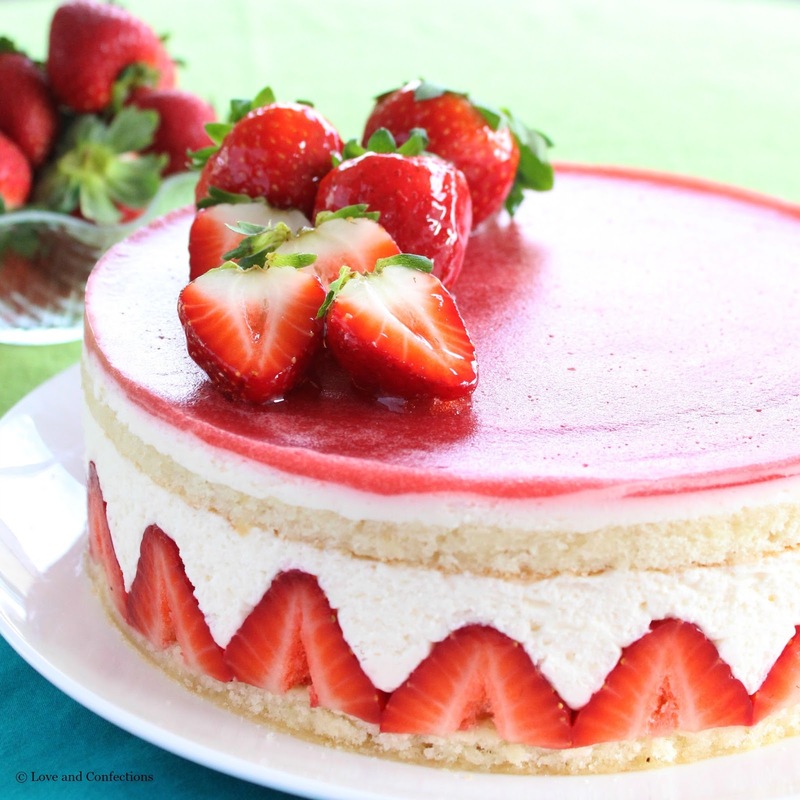 Strawberries are cut and decorating the sides, since it is what we would call a “naked cake” – no frosting on the outside to cover it. The filling is debatable, depending on the pastry chef and bakery. Some say just pastry cream or stabilized whipped cream, others say Diplomat Creme, Bavarian Cream, or Mousseline Creme. 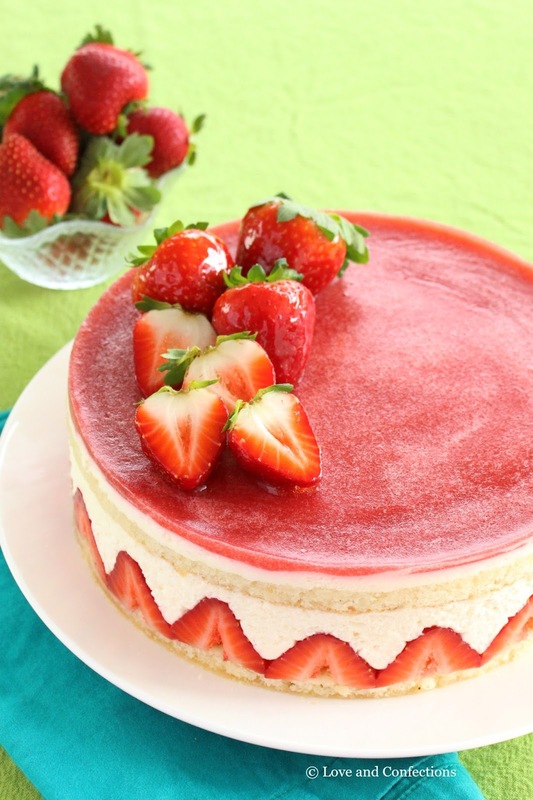 More strawberries or compote are included in the filling followed by a second layer of sponge cake. The Fraisier can be topped with marzipan, gelee, or other decorations. Any way you make it, Fraisiers are delicious! 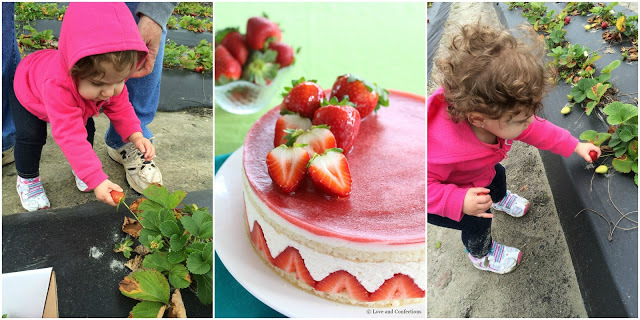 I hope you enjoy all the deliciousness of the Florida Strawberry season! *Pastry Cream should be made a day ahead to chill it properly. *Gelee requires a few hours to set, so plan accordingly for serving time. * I used an 8-inch Ring Mold and Acetate Cake Collars to prepare this cake. 1. Line two half-sheet pans with parchment paper or silicone baking mats and set aside. heat oven to 375F. 2. Prepare a bain-marie by placing a small pot filled with 1/3-1/2 with water on the stove. Make sure that the bowl of your stand mixer, when placed over the pot, does not touch the water. 3. In the bowl of your stand mixer, combine the Eggs and Sugar. Whisk over the bain-marie until hot and the sugar has dissolved. 5. Melt the Butter. Take about a cup of the whipped eggs and whisk it into the melted butter, then fold that butter mixture back into the whipped eggs. 6. Divide evenly between the two trays and spread with a palette knife. Bake for 15-17 minutes, or until golden brown and springs back when gently pressed. Do not over bake. Once it is cool, remove from the pan and lay each onto a sheet of parchment. 1. Place all ingredients into a small saucepan and heat until the sugar is completely dissolved, stirring occasionally. Store in a container for up to 5 days. Reheat before use in Fraisier. 1. Pour the Milk, Vanilla and Salt into a medium saucepan and scald. In the bowl of your stand mixer, whisk together the Sugar and Corn Starch. 2. Add in Eggs and whisk until smooth. Slowly pour the milk down the side of the bowl while the mixer is on low. Once it is all mixed in, pour the egg mixture back into the pan over medium heat until it is thick. 3. Pour through a fine mesh sieve into a medium mixing bowl and cool for 10 minutes while stirring occasionally. 4. Whisk Butter into the pastry cream until it is smooth. Cover the cream with plastic wrap, pressing down on the surface so there is no air to form a skin. Refrigerate until cool. 5. Once pastry cream is completely chilled, sprinkle the Gelatin over the Water and let it stand a few minutes to soften. 6. Place about 1 cup of the pastry cream into a large mixing bowl over a bain-marie. Heat until 120F, then add in the gelatin and whisk until smooth. Remove from the bain-marie and whisk in the remaining pastry cream. 7. In the bowl of your stand mixer, whip the heavy cream until it holds medium-stiff peaks. Take 1/4 of the whipped cream and gently stir it into the pastry cream to lighten it a bit before folding in the rest of the whipped cream in two batches. 1. In a small saucepan, cook the Strawberries and Sugar until soft, puree in a food processor or blender, and strain through a sieve. Use 150 grams of puree for the gelee recipe. 2. Sprinkle the Gelatin over the Water and let it stand a few minutes to soften. 3. Heat the puree in a small saucepan and whisk in the gelatin until smooth and completely dissolved. 1. Using your ring mold, press down onto the Genoise and cut 2 circles of the same size in each cake. Clean the mold and place onto your serving plate, tray or cake stand – making sure it is able to fit into your refrigerator to keep cold. Line the mold with an Acetate Cake Collar. 2. Place one of the cake circles, top side down, into the mold and make sure it fits firmly into place. Using a pastry brush, gently moisten the cake with the Vanilla Simple Syrup. 3. Firmly arrange the Strawberry Halves around the side of the mold, with the cut side out. Try not to leave any gaps between the base of the berries. 4. Pipe Diplomat Cream in between the berries and a small layer on the cake. Place quartered strawberries over cream. Pipe another layer of cream, leaving about 3/4-1 cup, covering all the berries inside and out. use a small palette knife to make the cream level. 5. Place the second cake layer on top and moisten with the simple syrup. Spread the remaining cream on top in an even layer. Pour the slightly cooled Strawberry Gelee on top in an even layer. Refrigerate for 4 hours. 6. Before serving, lift the ring mold and remove the acetate by gently peeling it away from the cake. 7. Optional garnish: heat 1 cup of Jelly with 1-2 tablespoons of water in a small saucepan. Dip Strawberries in, shake excess off gently, and place on top of cake. Serve immediately. Only garnish right before serving otherwise the jelly will not hold in the refrigerator. Store cake in the refrigerator for up to 2-3 days. Enjoy. For more great recipe inspiration head on over to Strawberry Sue’s website. Click here for more strawberry nutritional information. You can also see the Florida Strawberry Association Website, Facebook, Twitter, Instagram and Pinterest for more strawberry deliciousness. Also follow Strawberry Sue on YouTube and Twitter! The Sunday Supper Live Strawberry Event is also sponsored by Epicurean Hotel, Cask Social Kitchen, Ava, Edge Rooftop Bar at Epicurean, Elevage, and Bern’s Harry Waugh Dessert Room. This is seriously such a gorgeous cake! I just love it! This is gorgeous! I haven't made a fresh Fraisier in years! I can't wait to make this one! Simply amazing!!! I love this delicious strawberry cake.. I wish I could have this in my Wedding..
A stunning show-stopper dessert for sure! Well, it is truly lovely to see such beautiful cake. As I love to find and explore different types of themes for wedding invitations according to its theme, sweets and decoration, this gives me a new design idea of yet another wedding invitation card. Absolutely beautiful! What a gorgeous dessert! Pinning! Truly a show stopper saying, "Taste me!" "Taste me!" Terri, you never cease to amaze me with your talents. Can't wait to share this with my daughter-in-law who has a talent for baking because I am drooling for this beautiful dessert. Delicious!!! The cakes looks mouth watering and soft. Thank you for sharing this wonderful cakes. Strawberry is my favorite and thank you for this lovely recipe. Simply wonderful! 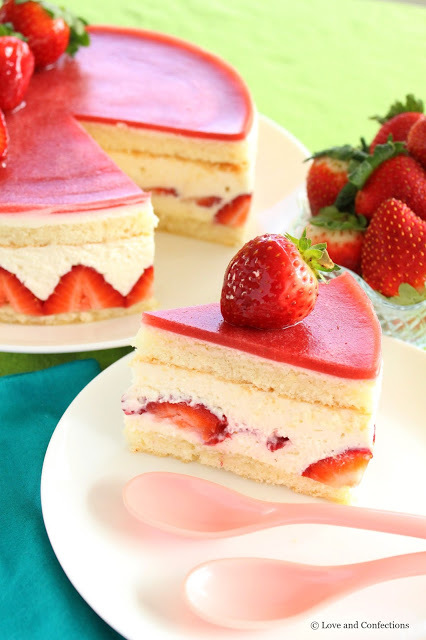 I love strawberry cake and your posted strawberry designer cake truly delicious. After seeing your cake I wish to have strawberry cake in my wedding. Really a amazing and tasty cake. Strawberry cake is delicious and fabulous. Kids are like strawberry cake. 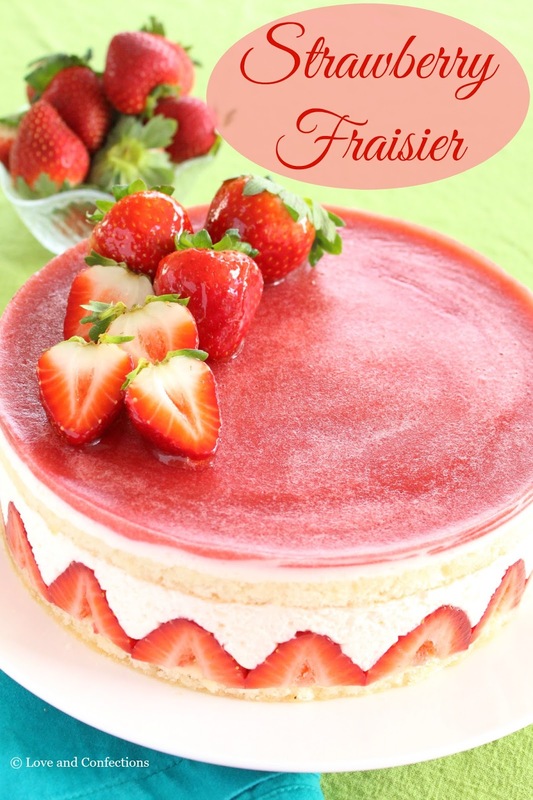 This Fraisier is looking very tempting. Thanks for the recipe. Will surely try. Thank you! Have fun making it! 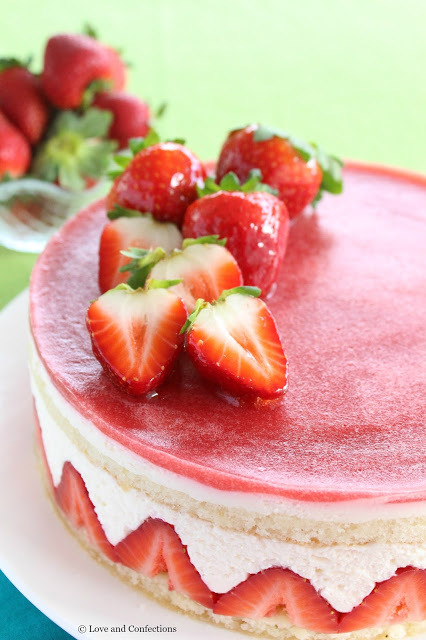 Very Nice Cool Post, Everyone like strawberry cake so it is a useful post. My next Sunday is gone a be very delicious.